One of the youth farmers arrived an hour before the rest of us on her own, and was blissed out from petting and feeding all the various animals. Branch Road is a biodynamic, diversified animal and vegetable farm on 73 hilly acres outside the small city of Cottage Grove. Andy has been raising and milking goats for about twenty years, and just recently stopped milking for the first time in two decades. Her pinkies are permanently bent from the act of squeezing udders every morning, but her face and frame are youthful, vibrant, and energized. I was blown away and super inspired by what she's accomplished and continues to tackle every season. First, the land. She got help from a local philanthropist to purchase her acreage after her marriage ended and she needed to re-start a farming operation. They'd been running a Grade A goat dairy near Dexter, and she was ready to step back a bit, diversify, and focus more on education and land stewardship. Branch Road Farm is still a work in progress, but in my eyes she's succeeded tremendously in creating a viable farm business, using it to educate children and adults, and working in harmony with the land. She has a herd of 25-50 goats, two heritage breed pigs, a donkey, a small herd of sheep, dozens of chickens, and a 1-2 acre veggie plot. She also built a commercial kitchen to produce value-added products like sauerkraut and jams, rent to local food producers for extra income, and host events and meals for friends and the public. There are two tiny houses on the property beyond her small refurbished mobile home, which provide space for people who are involved in the farm in some capacity. She runs a three-season, nearly full-diet CSA for 12-20 members, and sells at the Cottage Grove farmers market. Beyond all that, Andy struck me as a deeply compassionate, caring, present person who welcomed our crew graciously and showed genuine interest in their development and involvement in food production. 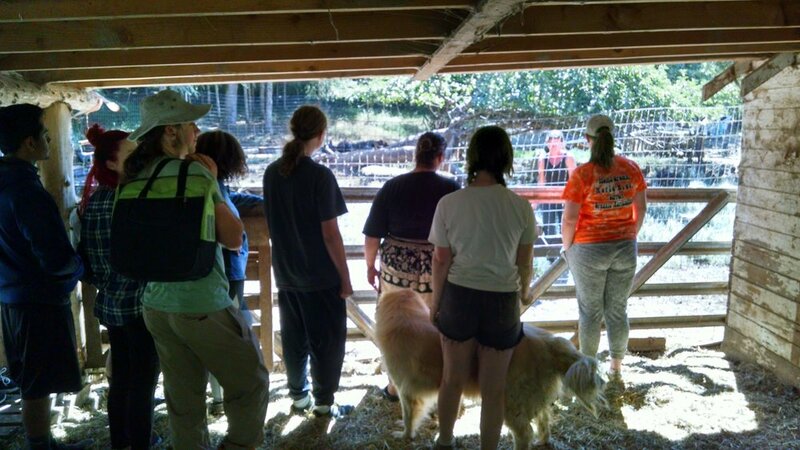 We spent a couple hours talking, walking around, meeting all the animals, and asking questions, and I left feeling inspired in this work, interested in learning more beyond what we do at the Youth Farm, and heartened to see how a farm can survive without being hell-bent on maximum production. 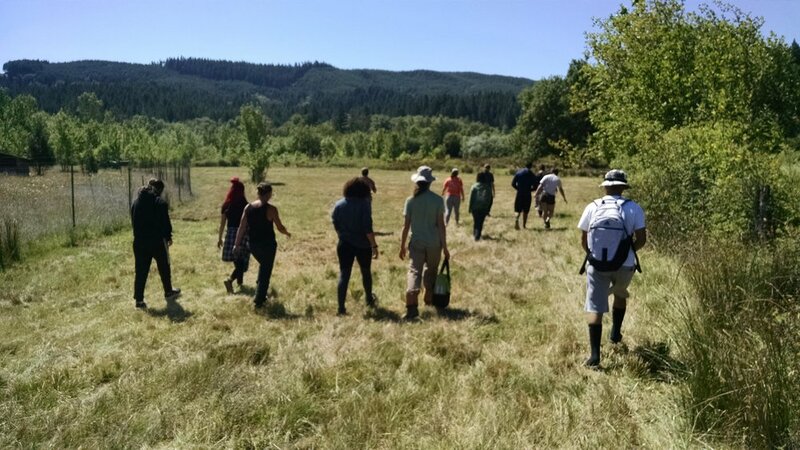 After a lunch stop in Cottage Grove, we headed to Grassroots Garden on Coburg Road in Eugene. I've been there many times for plant sales and various tours and material drop-offs, but never had I toured the garden with the coordinator, Merry. She has an incredibly positive reputation among everyone who's volunteered there over the years-- she seems to leave a deep impression on people, and inspire them to learn more and feel more confident in themselves both in and outside the garden. Finally, during my first tour with her, I understood why. She takes the time to explain everything well, makes relevant connections between what they're doing and why it matters, and makes education highly interactive and fun. She congratulated and gave big hugs to the three youth farmers who had volunteered with her before getting positions on the crew, remembered their names, and greeted everyone else with a smile and eye contact. She cares, and remembers, and acts as a mother figure in this collaborative, productive, community learning space. It was inspiring in a very different way from our time at Branch Road: I suddenly felt anxious and excited to give more tours this fall, welcome more new volunteers, share our mission and style with friends and strangers, try to be as memorable and inviting as Merry.